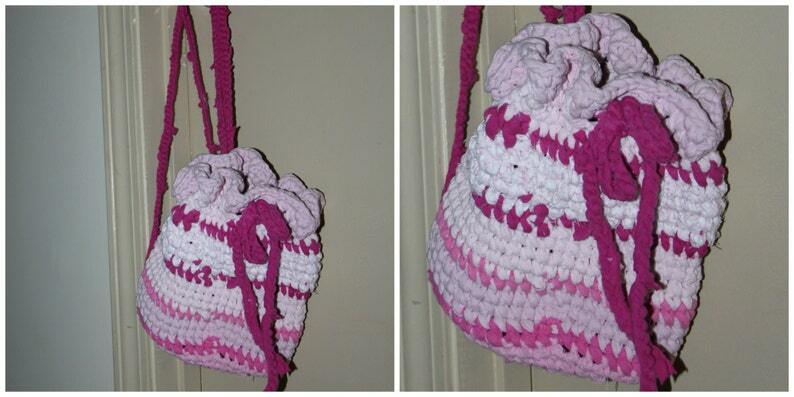 his super cute backpack type tote is made from shades of pink and white. It has a drawstring close. It is a bucket type build. The circular bottom measures about 8" across and is about 9" tall. The straps are about 30" long and are non adjustable. They could be knotted to shorten them if needed. Just as ordered! Quick turn around! Once a custom order has been placed there will be no refunds given unless there is a gross error on our part. Remember each item is unique and there is never an exact duplicate. If you purchase a ready made item from our store you may return it within 14 days. You are responsible for return shipping and there will be a 3% restocking fee. Thank you for understanding. I have switched to calculated shipping. I believe Etsy defaults to priority mail. You will have other options to choose from at checkout. If you have any questions please ask me before purchasing. Ready made items will be shipped within 3 business days of purchase. Custom orders usually take 7-14 days from purchase. You will be given a ship date at the time of purchase. If you need an item sooner, please contact me prior to purchasing so we can tell you if we can accomodate you. Thank you!